It’s crazy how quickly blackheads can develop if you are not paying attention to your skin. As you age, decreased elasticity in your skin combined with oil and skin cell build up may cause your pores to become larger. Although there is nothing you can do to actually decrease pore size, you can minimize their appearance. 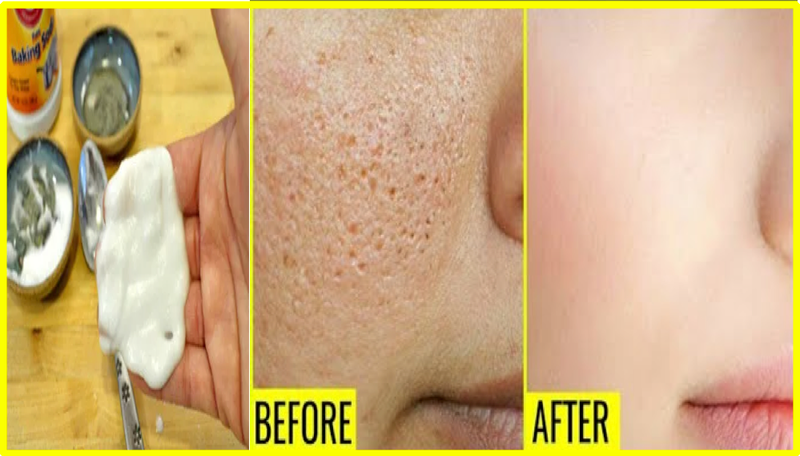 There are numerous products on the market that tighten the skin and that reduce the appearance of the large pores, but these products are usually over the counter. The good news is that you can now prepare your own natural remedies in your own home and eliminate the problem. If you are struggling with enlarged pores and pimples then the baking soda face mask will definitely help make your pores smaller. 1. Mix two tablespoons of baking soda and two tablespoons of water and mix well. 2. You will get a paste which you should then apply onto your face and let it dry for about fifteen minutes. 3. Once the mask tightens, wash your face with cool water. The baking soda has properties that help clear out the dirt and oil in your pores and skin exfoliation is the main one. It also corrects the pH balance of your skin, which is commonly overlooked.